To your favorite sellers list and you'll receive our emailed newsletters about new items & special promotions. 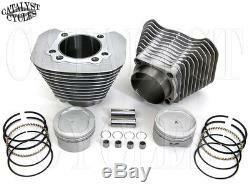 1200cc Cylinder and Piston Conversion Kit Converts your 883 Sportster to 1200cc. Includes two cast finished cylinders. Also includes a set of Sifton moly 9.5:1 reverse dome pistons and rings. Technical Note: This kit is a bolt-on application. No head work or other machining is necessary. Fits the 883 Sportsters from 2004 and later. We want your interaction with Catalyst Cycles to be a great experience. If the part you ordered is defective, doesn't fit, or isn't the correct part, you can return it. You have 30 days from receipt of the product to contact Catalyst Cycles for return information. Catalyst Cycles is not responsible for any losses or expenses incurred by the use of wrong or defective products or parts, or by incorrect installation of any products or parts. For us to process your return, we must first receive it. If necessary, you can file a lost item claim if it is not received by us. If there is an issue with your order, we will contact you as soon as possible to let you know. Payments must be made in U. In some countries, it may be illegal to receive some or all of our products or accessories. Limitation of Liability: Catalyst Cycles shall not be held liable for any damages that result from the use of products, parts, and accessories available. We also shall not be held liable for any such damage that results from the inability to use, misuse, or incorrect installation of any products, parts, and accessories. Catalyst Cycles shall not be held liable even if we have been advised of the possibility of such damages. Use and Participation: While we at Catalyst Cycles will make every feasible effort to review any communications within a reasonable time frame, we cannot review all communications and is not responsible in any way for the content of such communications. Catalyst Cycles reserves the right to edit or terminate these terms and conditions at any time and without prior notice. 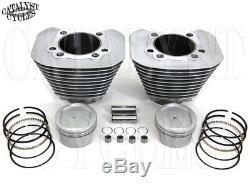 The item "Sportster Conversion Kit 883 to 1200 Silver Cylinders 9.51 Pistons fits 2004-UP" is in sale since Monday, September 4, 2017. 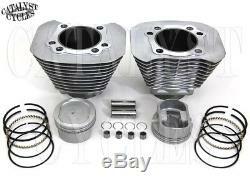 This item is in the category "eBay Motors\Parts & Accessories\Motorcycle Parts\Engines & Engine Parts\Big Bore & Top End Kits". The seller is "catalystcycles" and is located in Smyrna, Tennessee. This item can be shipped worldwide.